While printing with glass is now a thing, a 3D-printing materials manufacturer, 3Dom, has recently been printing with old coffee grounds. 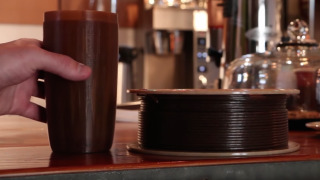 The company is calling it Wound Up, and says the 3D-printing filament is made using waste byproducts from coffee. It comes in a spool that can be used in any 3D printer that uses PLA materials, and produces 3D prints that are grainy and dark brown. And while the end product doesn't smell much like coffee, according to 3Dom, when "the object is being printed, there is a very distinct, sweet coffee aroma." "Now a cup printed with Wound Up is a true 'coffee cup'," the 3Dom said, going a little meta on us.